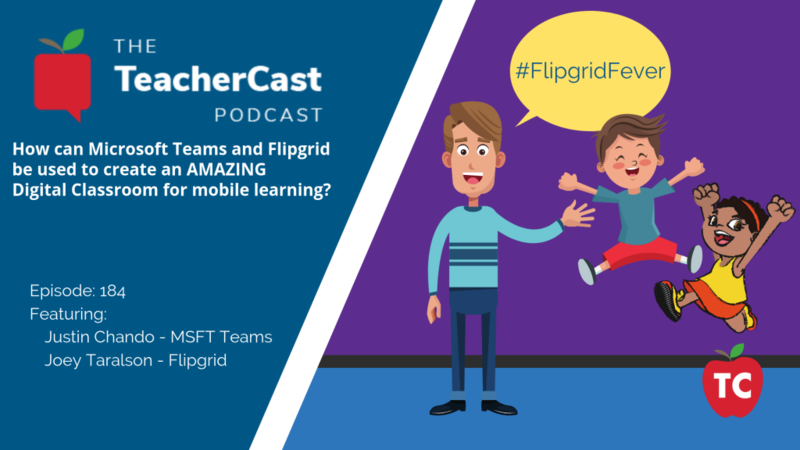 How can Microsoft Teams and Flipgrid be used to create an AMAZING Digital Classroom for mobile learning? In this episode of the TeacherCast Podcast, we welcome Justin Chando from Microsoft Teams and Joey from Flipgrid on the podcast to talk about how to create a seamless digital classroom using collaborative tools found in Office365. What’s new in Microsoft EDU? What can teachers expect from Flipgrid in 2018-19? Created a few years ago in Minnesota, Flipgrid is a video platform that allows students and teachers to share ideas and learn together. Building on the concept of personalized learning, Flipgrid has grown into the goto video learning platform in more than 150 countries. In a message heard around the world, Microsoft CEO Satya Nadella announced that Flipgrid would be joining the Microsoft family on June 18. How can I learn More about Flipgrid? The educator community for Flipgrid is VERY active in sharing great resources and providing help and feedback for those who are new to the platform.